Are you still unsure how your credit card payments work? Knowing the specifics can help you make smart decisions and manage your debt: how the payment is calculated, and how each payment goes towards reducing your debt (or not). Online credit card calculators provide some helpful numbers, but they don’t help you understand how the numbers work. Perhaps you’re considering putting a major purchase on your credit card, or you’re strategizing a debt payoff plan. Either way, you’ll be a wiser consumer if you go behind the numbers. Fortunately, the process of calculating your payments (and costs) by hand is not that difficult. If you can remember how to multiply—or get a calculator to do it for ​you—you’ll have everything you need. Start by figuring out the minimum payment required by your credit card company. This is generally calculated based on your balance. Example: your card issuer requires you to pay 3% of your outstanding loan balance. You owe $7,000 on your credit card. The minimum payment is 3% of $7,000, which is $210. To find that answer, multiply $7,000 by .03 (which is the same as 3% – learn more about converting percentages and decimals). Your minimum payment is determined by your card issuer, so you’ll have to look up the requirements specific to your account. Want to learn more? See how to find your minimum payment and common methods of calculating. When you make a payment, 100% of that money does not go towards your debt. 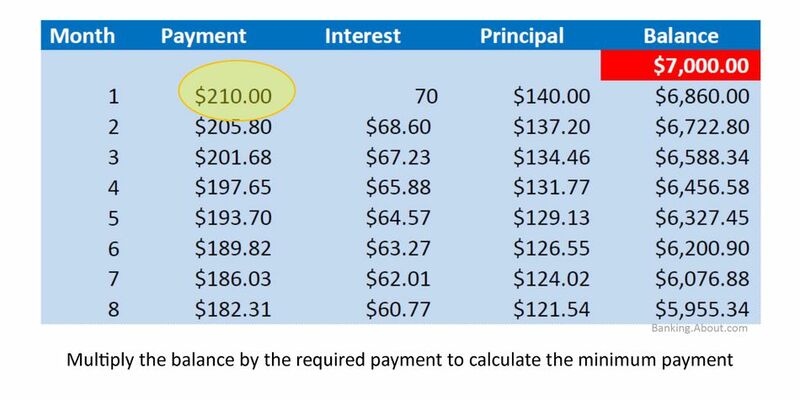 In other words, your balance won’t go down by $100 if you make a $100 payment (unless you’ve got a 0% interest deal). Instead, the card company will take their cut of interest first. After you pay interest, the remainder of your payment goes towards your debt (also known as the “principal” part of your loan). So you’ll subtract the interest charges from your total payment to figure out how much principal you pay off in any given month. In our example, your payment is $210 and interest charges amount to $70. Subtract: 210 - 70 = 140, so you’ll pay off $140 of your loan this month. That brings your loan balance down to $6,860 for next month. As you might have guessed, you’ll need that number to calculate the next month’s payment. If you do this all by hand, the process is time-consuming, but there are ways to speed the process. Note that if you pay more than the minimum payment, which is always a smart move, you’ll pay down your loan balance faster. The amount that goes towards interest this month is fixed – there’s nothing you can do about it at this point. But you can accelerate your debt repayment and spend less on interest next month by paying more than the minimum. You’ve seen how to calculate the payment and interest charges for a single month (and get started on the next month), but how can you calculate over a longer period of time? It may take a small amount of spreadsheet wizardry, but it’s not the hardest task, and you’ll have a valuable skill. With each new row, look back at the loan balance at the end of the previous month (in the row above it). For a sample of how your spreadsheet might look, skip to the last image of this tutorial. By now you have a basic understanding of how most credit card payments work. But every card issuer is different, and your card might work slightly differently. With what you’ve already learned, you should be able to figure out how to calculate your own payoff with just about any card issuer.